Best small safes for dorm rooms – Parents sending their children off to college are often overcome with many worries. Parents want their children to be able to learn in a safe environment but also make friends and memories that last a lifetime. As college campuses become more populated and the digital age progresses, requiring students to have more valuable electronics in their dorms and in the classroom, parents are searching for ways to help keep their children and their valuables safe. Parents are not only concerned for their children’s laptops and mobile phones but also for the valuable items that they may even use daily, such as jewelry, keys, and medication. Because of these concerns, we have comprised a list of popular, quality safes that students can use in their apartments and dorm rooms to keep their personal possessions safe. 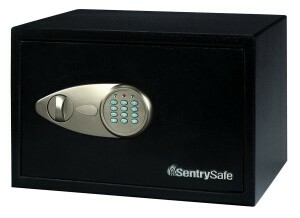 This small, sturdy safe provides good security for small apartments or dorm rooms. Although not quite large enough to fit laptops or other electronics, this safe can efficiently protect jewelry, passports, cell phones, or other small valuables. A solid steel construction that features a pry-resistant door with 2 steel live action bolts and concealed hinges. Interior is carpeted to protected valuables from scratching. Easy to use and program electronic lock that require 4AA batteries. Users can set an access code with 2-8 digits. It also features a hardened steel plate to resist drill attacks. 2 override keys are provided if the user in any circumstances can’t open the safe through the electronic lock. The SentrySafe X055 is designed to be bolted down easily with the provided hardware and the pre-drilled holes to increase its security. 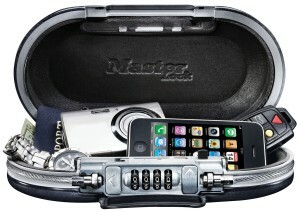 This product has minimal security but is good for storing small valuables and electronics. Ideal for college dorms or small apartments, this safe has thick steel walls that weigh it down and provide security against casual thieves. Online reviews state that this product’s lock can be picked by more experienced thieves. Best used when secured to a sturdy surface. Solid and secure construction with the concealed hinges and 2 live action steel bolts that provide great security. Foolproof electronic lock that is easy to program. Users can set a 4-8 digit code, and disable the beep sound from the keypad. 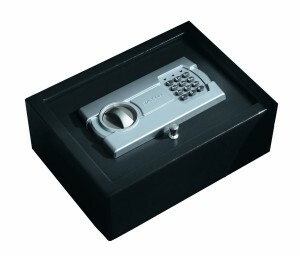 Access the safe with the override key through the key lock underneath the key cover. The override key can be used to program the electronic lock and gain you access if you are locked out. Factory holes and hardware to mount the safe is provided. Firearm storage approved by California DoJ. 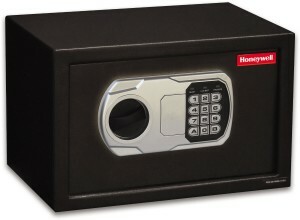 This safe is good for storing sensitive documents and small electronics. Ideal for small, private rooms, this lock has a loud digital pin feature that may disturb roommates. Although the small size of this product prevents it from storing large items, its small size allows for it to be easily hidden. Solid construction with bolt-down capabilities, a pry-resistance steel door with 2 live action bolts and concealed hinges. The steel body is scratch resistant with the powder coat finish. Hustle-free programmable electronic lock with an LED display and a beep sound when a button is pressed. Gain secondary access to the safe with the override key. Can be mounted with the pre-drilled holes in the bottom and on the back. This small portable safe is ideal for traveling or securing small valuables in an apartment or dorm room. The portability of this item can be very appealing to students who carry small valuables with them around campus. However, this product is not ideal for securing large valuables or absolutely irreplaceable items as it can easily be carried away by thieves if not secured. The lifetime warranty that comes with this safe can also be very beneficial to students who often travel abroad. Durable and water resistant construction with a foam padding interior that will protect your camera, phone, keys, money, jewelry or whatever you want to secure in your dorm room. 4 digit combination cam lock that is easy to use and to program to hold your preferred combination code. Waterproof construction that keeps the content dry. Features an access port that can be used to charge devices or listen to music. These small safes all can be effectively used in a college dorm. Most of them aren’t large enough to store laptops but can store medication, jewelry, and other valuable electronics. When weighing the pros and cons of each product, make sure you have an idea of where you are going to store your safe, as some safes may be used more effectively in one location over another. Most safes can be fastened to furniture or the floor but many college campuses prohibit students from drilling holes in their dorms.